Keep an eye on what's cooking and tempt customers with appetizing sights and aromas. These new premium pizza and snack ovens feature a lighted interior cabinet, see-through tempered glass door and 30-minute timer with hold feature. Transform your pizza oven into a multi-purpose oven with these new Baking Sheets. Designed to work with the 515, 508 and 507 pizza ovens, these baking sheets are great for baking cookies, snack foods, appetizers, mini and personal sized pizzas and more! The 12” Commercial Countertop Pizza Oven has been used extensively by frozen pizza manufacturers for 30+ years. This restaurant pizza oven is designed to bake thin and regular crust pizzas fast! Delivers desired taste, texture and appearance! Countertop pizza oven is NSF and UL listed. This commercial countertop pizza oven quickly and conveniently bakes regular and thin crust pizzas in 15 minutes or less. Features pre-set temperature, 15 minute timer and ergonomically designed flip-up handle. Versatile countertop pizza oven bakes all kinds of frozen pizza including popular Rising Crust style. Commercial pizza oven also bakes popular frozen snack foods, chicken strips, waffles, single serve entrees and more! This countertop pizza oven is NSF and UL listed. 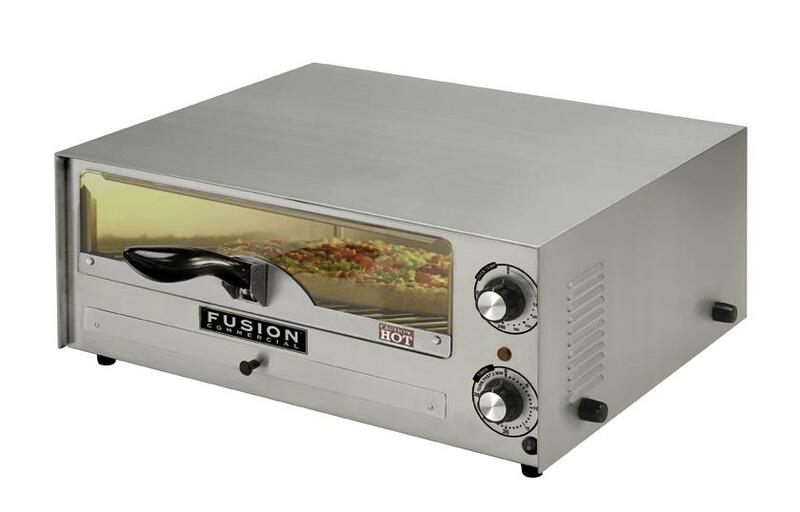 Countertop restaurant pizza oven features adjustable temperature control - 150F to 450F, 30 minute timer, and ergonomically designed flip-up handle. This large capacity restaurant pizza oven bakes all styles of frozen and “take and bake” pizza up to 16”. Commercial countertop pizza oven also bakes popular frozen snack foods, chicken strips, waffles, single serve entrees and more! This large countertop pizza oven is UL Safety and Sanitation listed. Features adjustable thermostat, 30 minute timer, ergonomically designed flip-up pizza oven handle and “power-on” light. This pizza merchandiser/snack merchandiser is a great way to display your delcious pizza and other snack items! The perfect compliment to our 508FC and 515FC pizza ovens in self-service environments. You’ll be blown away when you see our price on this pizza merchandiser model! Pizza merchandiser is UL Safety and Sanitation listed. 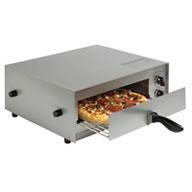 This snack/pizza warmer also features an adjustable thermostat and three heated shelves with raised racks. Each shelf holds up to 16” pizza.